Villa Suites are a villa style rooms where a private bathroom is facilitated in all of the rooms. Not only can you enjoy a more private stay, but you may also enjoy the different tastes of the 11 houses. And with the birth of the Villa Suite, the "Hyosekikaku the main building" which is a 100 year old historical architecture, has become a genuine Kaiseki Japanese style restaurant and has transformed into a combined resort facility in which further substantial long stays has become possible. 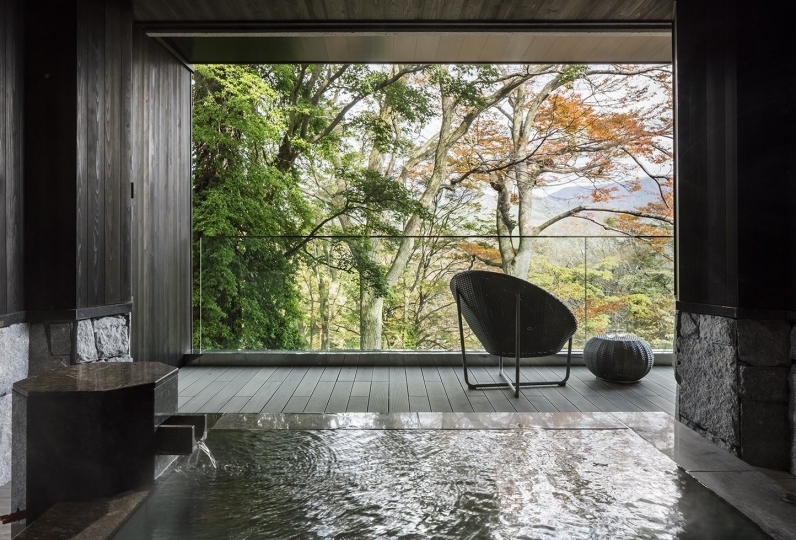 What NEST INN HAKONE Villa Suites deliver is a luxurious silence. It is the time to heal the tired body and soul from the hustle and bustle of the city, and to regain back your true self. Surrounded by the grand nature of Sengokuhara that spreads before your eyes, you will hear the sound of spring water, smile at the gradation of the lights of morning and night, and be awed by the night sky full of stars. You will realize when you wake up that when true relaxation is experienced, there is no need for words. thank you for helping me. I went to for the first time, but the smile and entertainment of the staff were very bright! Thank you very much. Thanks to the origin of Hakone, the left shoulder, which was not well recovered, was also recovered. It was also a great trip because I could spend leisurely. The hotel stayed in January, last time we stayed in the hotel, the room and the bath, we prepared the main house and so on, the meal is not delicious, the meal is not devised such as arrangement etc, the service is the same as our breakfast, the service is bad, I can not get it. I wrote that it is unworthy. With this amount it is impossible. I talked directly to Mr. Relax. January, with family. I planned to go with my friend in February and thought about cancellation but I do not know how long it will change in one month but believe the word that I will do my best and overwrite that I have a responsibility to see the change beyond my word of mouth It was. I have been visiting a ryokan about 3 times a year with my friend, and I was worried, although I talked about this circumstance. How a wonderful change. From the arrival of the car, there was a good greetings and the customer service was good. The dish was devised, the arrangement was wonderful, it was very tasty. I thought that it was room changing and I tried hard to make it better at all. Friends are also very happy! I enter three fingers of a ryokan that I have stayed in so far. We have only one place of inn which we have repeated, but I would like to ask again in autumn. Even though I was the opinion of one person, thank you very much for listening. This time, I came to visit with my family in a celebration of marriage 35 years. It was a start-up campaign price, but I was hoping that it was actually a quite expensive inn. The rooms are spacious, relaxing like chairs, tables, beds and baths. I thought that the view from the room can be enjoyed every season. Because my son tells me that it is a celebratory trip, so thank you very much, such as champagne and juice in the room, celebrating plate of meal etc. However, it became a trip that remained quite dissatisfied. I will write it if it is this price setting if it is unavoidable that facilities are good. ① It was the first time that we did not get welcome drink or sweets at the inn at this price setting zone. ② A meal is served, and there is no ingenuity in vessels and it is not tasty. I do not have any today because I do not see the dishes that I saw on drafts. A thing with a print mistake. Is there such a thing? Cook that was hard and not bitten, and dessert is just fruit. Breakfast is the same as breakfast at home. It was the first time that I went to a ryokan with my family and husband and it was said that the meal was not delicious. My daughter asked for soda dish of plum wine, but plum wine and soda are charged for each and it is a plum wine sourse which is quite expensive. ③ My wearing clothes was like a sweat, I was surprised with all the faded hairballs. ④ At the time of payment, the regular price was charged instead of the campaign price. I happened to have a tablet that I just happened to have, but this was also my first time. ⑤ Even though there was something I wanted to ask at the meal, there were no people and I went searching to the kitchen. Also, there are many foreigners who are good for foreign customers, but for Japanese customers, for customers who come to this price range, I want a care that can be issued because they are Japanese because they say that they are lacking in study. I think repeaters are difficult if there is no service offering that matches the price. I have made a reservation with friends of gourmets from February 22 before traveling this time, but it is quite uneasy whether I am improving. At the architecture of Sukiya(tea ceremony hut) structure there is the reception, Ryotei(Japanese restaurant) where you may taste genuine Kaiseki cuisine and a tea house which you may enjoy casually, and you may feel the history of 100 years. In the four seasons of spring, summer, autumn and winter, there are 3 more changes in taste even for the same food in the same season such as "Hatsumono", "Shun" and "Nagori".The most freshest food are chosen not only from the local of Kanagawa and Shizuoka prefecture but from all over Japan. And the slightest change is not overlooked and the food is cooked in various types of cooking techniques where the best of the food is extracted, arranged in a form where its appearances are highlighted. Please enjoy the new Kaiseki cuisine where the food is cooked to serve the taste of today while paying respect to the history and tradition of Japanese cuisine. The untouched nature will always be mysterious and speaks to us what true beauty really means.NEST INN HAKONE which stands in the woods of Hakone, Sengokuhara was renovated and born by the inspiration and liberal idea of the traditional hot spring hotel, Hyosekikaku, under the concept of "living and resonating with the forest".And the essential factor of a trip is the joy of eating.At the Wood Side Restaurant, you may enjoy cuisines that use the fresh meat, vegetables and fish of Komagawa area, a place where it is known for its food. Please savor the trip of gourmet in the forest. 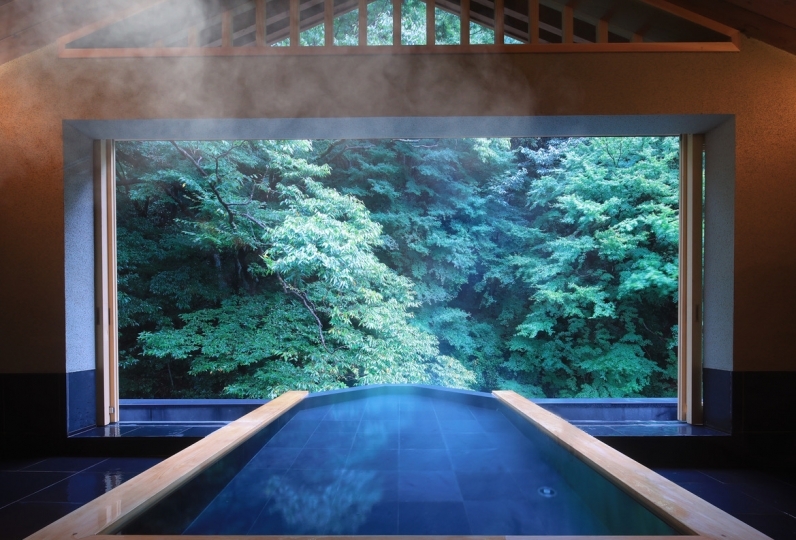 The hot spring drawn directly from Owakudani is very precious and with the rich and opaque acid, calcium, magnesium, sulfates, chloride spring, it causes beautiful skin effect, warms the body and has benefits for neuralgic and arteriosclerosis. Enjoy ultimate relaxation with the time in the woods. You may use the Western meal restaurant within the area of NEST INN HAKONE, and may also use other facilities. If you search by the phone number when you use the car navigation, the old address may be indicated. It may be better to set as Hakone Glass no Mori Venetian Glass Musuem which is in front of the hotel when you search. 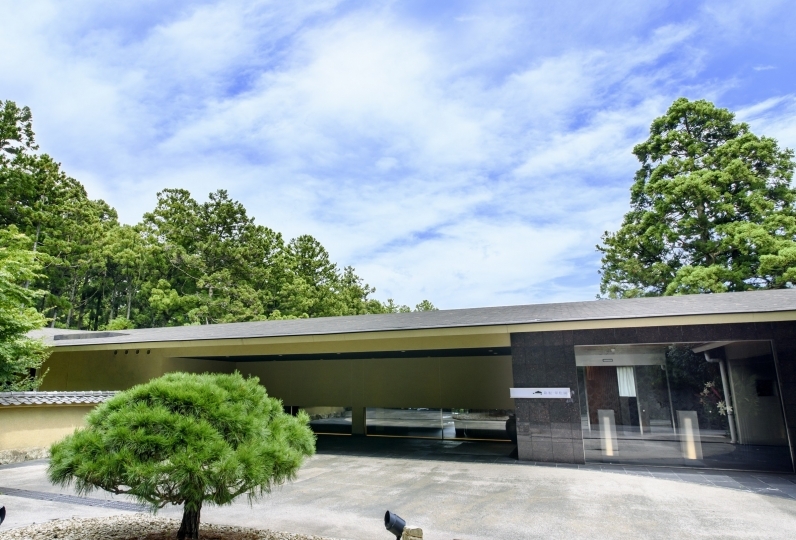 The hotel's entrance will be diagonally front to the Hakone Glass no Mori Venetian Glass Museum. 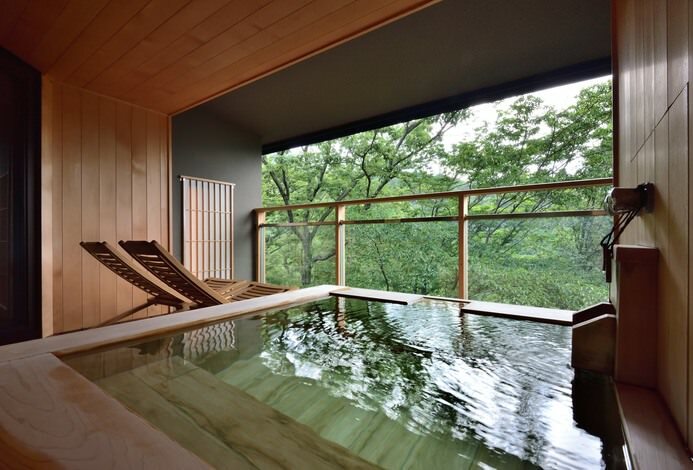 The hotel is a facility of approximately 15,000 tsubo located in the great nature of Hakone. Therefore, to go to the restaurant hall Hyosekikaku, you will need to walk outside. And for this facility is for the guests to feel the sound, wind, and lights of nature with your five senses, television is not facilitated in the rooms. Audio appliances are prepared. And children in elementary school and under may not stay at this hotel. This hotel is for the guests to experience the fuse with nature and enjoy  time away from the everyday, therefore children in or under elementary school are not permitted to stay. 72 of people have viewed this page within the past 24 hours.